The Q7 e-tron quattro, pictured in Geneva, is Audi's second plug-in hybrid after the A3 e-tron. GENEVA -- Audi will offer its Q7 premium large SUV with two plug-in hybrid powertrains: a diesel variant for Europe and a gasoline version for the U.S. and China. 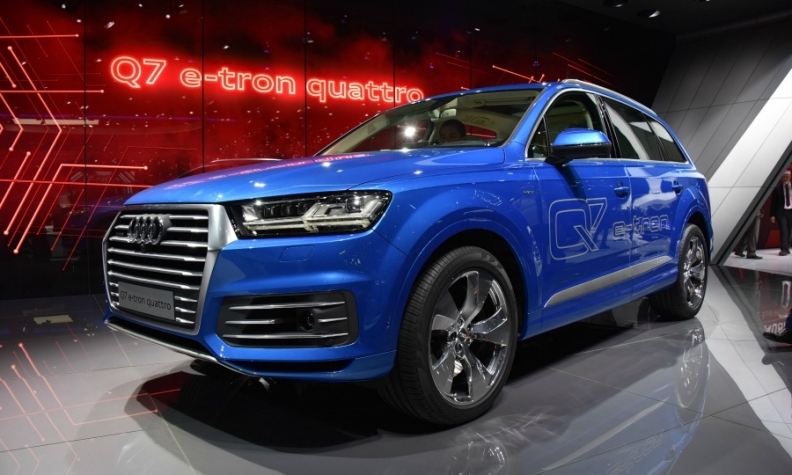 The Q7 e-tron quattro will be Audi's second plug-in hybrid. The A3 compact car is currently offered with a gasoline plug-in hybrid powertrain. The Q7 plug-in diesel hybrid will use a 3.0-liter, six-cylinder diesel engine mated to an electric motor. It can be driven for up to 56km (35 miles) on battery power alone. Audi says the model emits just 46 grams of CO2 per kilometer. It has combined power of 373 hp as well as an eight-speed automatic transmission. The diesel engine will be replaced by a 2.0-liter turbocharged gasoline unit for the U.S and China, Audi development boss Ulrich Hackenberg said. "We have a modular system that allows us to react to the different needs of the world," he said at a press event last week. Audi could still add the diesel hybrid to the U.S lineup at a later date. “In the U.S. we are having success with diesel cars. We are analyzing the market so maybe we will also have a diesel hybrid,” Hackenberg said. The Q7 plug-in hybrid has active engine mounts that work to cancel out the vibration from the diesel engine, as well as a thermal heat pump that transfers waste heat from the electric drivetrain to warm the cabin. The car will be able to use its satellite navigation system to find the most-efficient balance between diesel and electric power by analyzing the route ahead. When approaching traffic signs indicating lower speed limits or traffic lights, the drivetrain is given a visual signal as well as a pulse through the accelerator to remind them to slow down, a feature Audi calls a predictive efficiency assistant. The Q7 diesel plug-in will go on sale in its home market of Germany in spring 2016. Audi did not say when the gasoline plug-in would launch in the U.S. and China. The company also did not disclose any information on prices. It said the Q7 e-tron will be the top model in the Q7 range. The most expensive Q7 currently costs 76,100 euros in Germany.